Traditional spring cleaning isn’t as critical as it was ‘back in the day’ when fireplaces were the main source of winter heating. Warmer spring weather presented opportunities to get rid of the built-up dirt and soot from winter. Even if you’re not planning a ceiling to floor deep clean, spring is the optimal time to take care of maintenance tasks for your HVAC system. During winter months in White Plains, MD, your HVAC system worked hard to keep your home at a comfortable temperature. With the moderate temperatures of spring, you rarely need to turn on the heat or air conditioner. So, let’s explore typical HVAC preventative maintenance, before summer heat hits White Plains, MD. Note: You can likely take care of routine tasks, but the best option is to schedule a professional HVAC technician for annual preventative maintenance at the beginning of spring. It’s easy to forget about checking your air filter, but unless you change it on a regular basis, dirt and contaminants can clog it up enough to impede quality airflow. Your energy costs will likely skyrocket, while your comfort level will plummet. Homeowners may overlook regularly cleaning of floor registers and air vents. They play a vital role in amplifying airflow from your HVAC system. 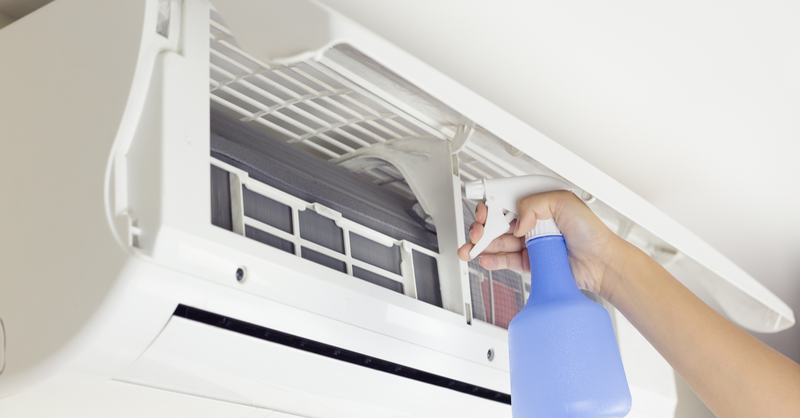 Ensure that your spring cleaning duties include vacuuming and dusting the vents and registers in every room. It may seem like a good idea to cover your AC condenser during winter weather. If you did, ensure that you remove coverings from outdoor condensers and coils, before starting your HVAC system. Actually, your outside unit was engineered to be hardy (like mailmen) during rain, sleet or snow. Running your system, while covered, often leads to serious repair or possible replacement of your whole HVAC system. Since it’s not good to cover the outdoors coil, dust and other debris probably collects on it during winter. When the coil is not clean, it can’t perform its job to transfer heat. Before turning on your AC, ensure the outside coil is clean. You can carefully spray the area with a garden hose, but don’t get water on the electrical panels. Pull up weeds that could interfere with the airflow. Exterior panels protect the HVAC electric connections. Panels that are askew or gone, potentially endanger electrical equipment. This is too intricate for a DIY task. Call your HVAC technician for assistance. Because ductwork is hidden from view, in inside walls, attic and floors, you may not think about it. When air ducts aren’t in good condition, your AC will not cool properly. Checking for crimps, leaks and so on is a job for certified technicians. The condensate drain is on the inside unit. Its purpose is to eliminate moisture from humidity in the air, while your AC is running. The air temperature in your home is higher than the coil’s, so that any water that is present in the air condenses on the coil and collects in the drip pan. Unless water from condensation streams into a drain, the drip pan can overflow beneath your AC unit and cause a terrible mess. Assess the line to ensure it is connected and isn’t broken or leaking. Finally, when spring gives way to summer in White Plains, MD, turn on your HVAC system and ensure cold air is blowing from the indoor vents. If hot air is coming out of the vents, or if no air is blowing, shut off the system and call your HVACcompany for an appointment.